That night, Lida and her friend Susan hurried down the street. 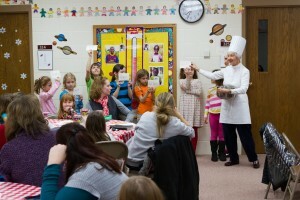 “I have an idea,” Mrs. Bauman said to the twelve girls who gathered in her living room. “Let’s organize a Sisterhood of Mary and Martha.” She had them turn in their Bibles to Luke 10:38-42. “Let’s read it out loud together,” she suggested. The girls began to talk excitedly. What could they do to serve God? That small group that started in Philadelphia in 1906 inspired other churches to start Sisterhood of Mary and Martha, or SMM. Although Mary Bauman died in the flu epidemic of 1909, the flame had been lit. By 1913, SMM was growing like wildfire, and that April the national women’s organization of the Brethren Church adopted the Sisterhood of Mary and Martha as a daughter organization, with 35 official groups involved. Girls could complete goals for skills such as scripture memorization, sewing, and cooking to earn awards. The SMM groups were known for their dual purpose: worship and service. They used the color white to remind them of the purity of Christ and that they were to worship Him. Green represented the value of serving God and reminded them to grow in Him. One thing that characterized the groups was that the girls did not just sit for lectures, as most church groups did. They were actively involved in finding ways to glorify God by serving others. When Dr. Florence Gribble in central Africa asked for bandages, the girls joined with the women in tearing up old sheets and rolling the strips into bandages. The time spent together rolling bandages offered great opportunities to talk. Times of serving together helped the girls bond with their leader, or patroness, in a way that encouraged mentoring. To this day, if you ask a girl about her experience in SMM, she will usually mention her leader’s influence in some way. Ten years later, Junior SMMs were started for 4th through 6th graders—up to that point only 7th through 12th grades were involved. It wasn’t until 1962 that the first Little Sisters group for grades 1-3 began. Shortly after that, the tradition of Girl of the Year coronation began. Girls had an opportunity to dress up and show their gifts and talents at national conference. SMM became a part of the Christian Education Department of the Fellowship of Grace Brethren Churches in 1974, and Dottie Franks was hired as the first part-time director. She began an extensive re-organization of the program and handbooks. Three years later Judy Ashman (now Judy Fairman), was hired as the first full-time director. Another big reorganization began in 1990, under director Chery Otermat. AN SMM cabinet was created that helped develop material. The world was changing, and SMM worked hard to promote a crucial understanding in the churches: the concept that it’s easier to build a girl than repair a woman. In 2003 SMM again moved under the leadership of the national women’s organization, Women of Grace USA. The needs of society and Grace Brethren churches called for SMM to focus less on having the girls’ complete goals and more on helping them develop Christ-like attitudes and spiritual growth. As SMM celebrates 100 years, the organization plans to build on their values of service and worship in a way that connects to the depths of girls’ hearts. They want to prepare young women to overcome the world’s lies with God’s truth, to teach them to stand firm, and to equip them for whatever calling God may have on their lives. The girls will be encouraged to see the harvest field and understand their roles as workers in God’s harvest. In addition to new curriculum for grades 1-6, “Beautiful You” conferences for teens are hosted to help them focus on beauty that matters. A class will be available through the Center for Women’s Leadership Studies at Grace Theological Seminary this fall to encourage and refresh leaders in their quest to connect girls with God. “Daughters of the King: Ambassadors for Life” is a special event which will be held during Momentum Youth Conference in Marion, Ind., July 18, to celebrate 100 years of SMM ministry and set a vision for the future. Any women with ties to SMM is invited to participate. Please go to co-ju2.wix.com/girlsoffaith#!daughters-of-the-king for registration details. There will also be a special celebration at Vision2020. SMM’s focus on ministering to the hearts of girls has helped those involved in the organization to glean many valuable insights for connecting the hearts of girls to God’s truth. However, if a church or individual wishes to minister to girls, the staff of SMM is glad to help personalize a plan to accomplish goals. For more information, call 260-402-4241, email smm@wgusa.org, or check out their website at wgusa.org/discipleship. Editor’s Note: Viki Rife is the director-elect of Women of Grace USA, the national women’s organization of the Fellowship of Grace Brethren Churches. Since 2002, she has served the group as Communications Coordinator and Director of Girls’ Ministry. Nicole Miller is the Girls’ Ministry Coordinator, a position she has held since 2009. This article originally appeared in the Summer 2013 issue of GraceConnect magazine. For a free subscription to the magazine, email your address to amyers@bmhbooks.com.